On a recent trip to the North Somerset coast, I came across this rather unlikely statue of a man with a dead albatross hanging around his neck. 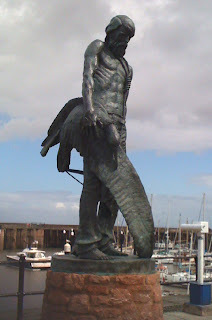 Obviously it depicts the Ancient Mariner, from the poem by Samuel Taylor Coleridge, but what's it doing in the small fishing village of Watchet? The answer is simply that Coleridge used to live in this part of the world... in fact Watchet is only a few miles from the place where he had his famous encounter with The Person from Porlock. As mentioned in my Porlock piece, Coleridge was a bit of an opium-head... a fact worth bearing in mind when trying to make sense of The Ancient Mariner. It reads almost like something from the pages of Weird Tales magazine -- a far cry from the cosy "gothic horror" that was all the rage when the poem was written in 1798. The Ancient Mariner is a tale of supernatural horror, but there's nothing cosy or familiar about it. Even H.P. Lovecraft remarked on its "sinister daemonism". As in Lovecraft's own At the Mountains of Madness, the horror in Coleridge's poem emanates from the Antarctic regions. And it's something much less tangible than an albatross. The Mariner's shipmates hung the bird around his neck as punishment for shooting it, because they thought it was a friendly spirit that had brought them good fortune. This was mere superstition, of course, and the bird was really just a bird. Unfortunately, it was a bird that happened to be a particular favorite of an immaterial (and distinctly unfriendly) creature that inhabited the South Pole... and that's when the weirdness really starts! As Coleridge says in a side-note: "A spirit had followed them; one of the invisible inhabitants of this planet, neither departed souls nor angels; concerning whom the learned Jew, Josephus, and the Platonic Constantinopolitan, Michael Psellus, may be consulted. They are very numerous, and there is no climate or element without one or more." Here Coleridge is using a trick that Lovecraft later made his own -- hitting the reader with a mixture of real and spurious references in order to add verisimilitude to his tale. Josephus, of course, was a famous historian who wrote on a great number of subjects... although immaterial spirits of the Earth wasn't one of them! On the other hand, the less well-known Michael Psellus did produce a treatise called De Operatione Daemonium in the 11th century, which does indeed describe ethereal spirits of the kind imagined by Coleridge. The polar daemon dispatches a couple of avatars in a spectral ship to deal with the hapless crew, all of whom are slain except for the Ancient Mariner. The latter seems condemned to a slow death in the freezing, windless ocean, while the eyes of his dead crewmates continue to stare accusingly at him. Unexpectedly, Heaven comes to his rescue (for the simple, and typically bizarre, reason that he manages to look on a writhing mass of sea-snakes with something less than utter revulsion). The corpses of the crewmen are reanimated... but not with their own, now departed souls, but with angelic spirits. There is one final bit of weirdness. As the ship speeds homewards at an unimaginable pace, there is still no trace of a breeze. 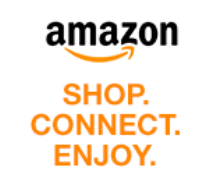 A disembodied voice asks "But why drives on that ship so fast, without or wave or wind?"... to which a second voice answers "The air is cut away before, and closes from behind." That sounds very much like the mode of operation of William Heath's "Grand Vacuum Tube" described in An Intercontinental Rapid Transit System (1829)! Coleridge's 'Mariner' is easily one of the most evocative poems I've read and particularly for the imagery and message that pre-dates zombie fiction and ecological awareness. How could anyone not be moved to imagine the scene? It's one of a kind for the period and continues to mean something to readers ever since. Great stuff! A similarly distinct narrative, with a mariner theme, is 'Phantas' by Oliver Onions. I'd appreciate your thoughts as nobody seems to have read it. Thanks for your comments. I agree it's a great poem -- quite unique and way ahead of its time in many ways. You'd be tempted to ask what Coleridge had been smoking... except we all know what he'd been smoking! I have to admit I'd never heard of Oliver Onions - thanks for putting me onto him. I've downloaded the story you mentioned, but it will probably be next weekend before I get a chance to read it.